We escaped from The Big City (Juneau) and returned to quiet places, anchoring near the top of Admiralty Island and the lighthouse at Point Retreat. 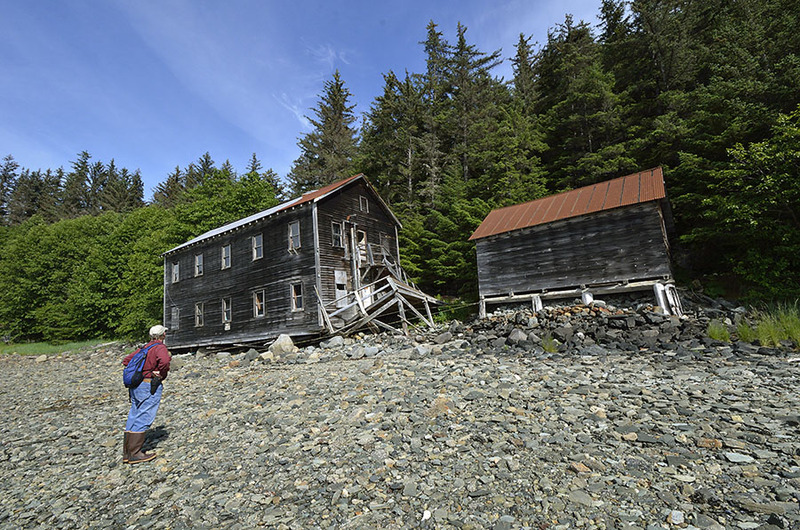 We’ve always wanted to explore Funter Bay on the northwest corner of Admiralty, rich with history from logging, a cannery, mining, and the unfortunate internment of about 500 Aleut natives during World War II. 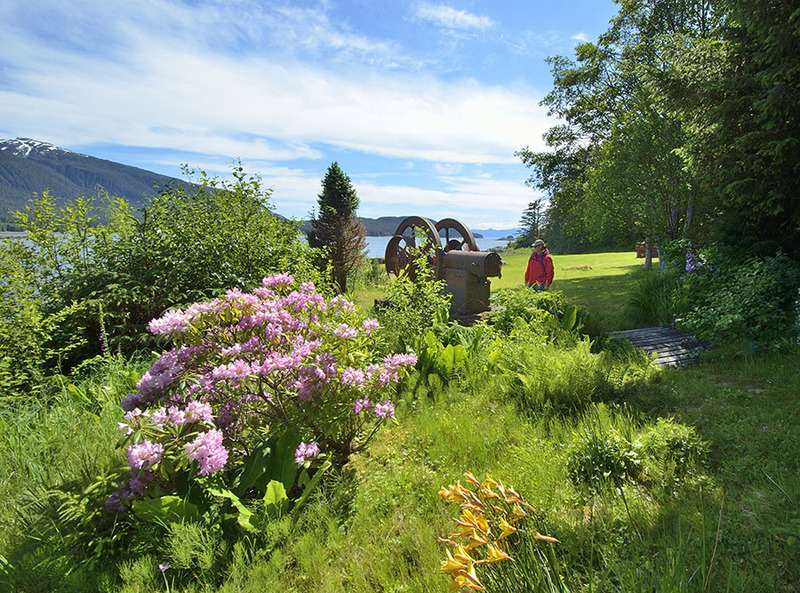 Today Funter Bay is a small community of private homes, all off the grid and accessible only by private boat or float plane. 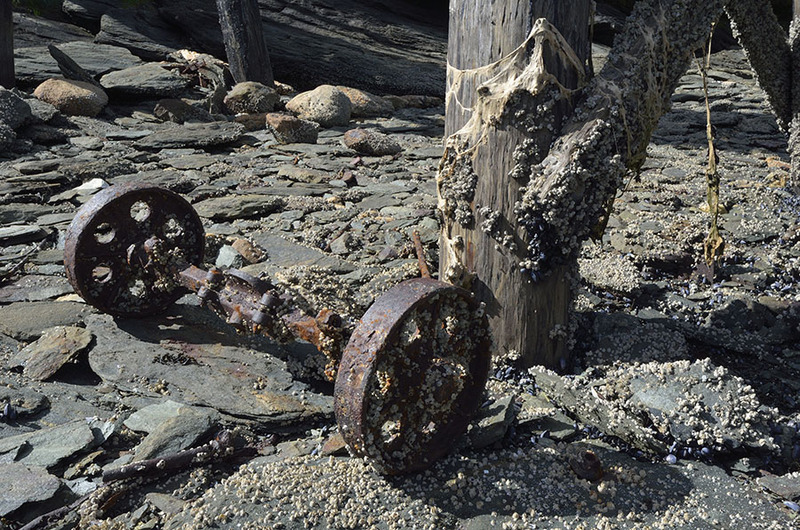 Remnants of cannery machinery can be found all around, on the shoreline and in the woods. Funter Bay was a lively place with the cannery that opened at the beginning of the 20th century as well as an active mine early in the century. One of the first women mining engineers was hired to work in Funter Bay in 1929 – the hiring manager thought it odd for a man to have a woman’s name, and he never considered that Helen was actually a woman! 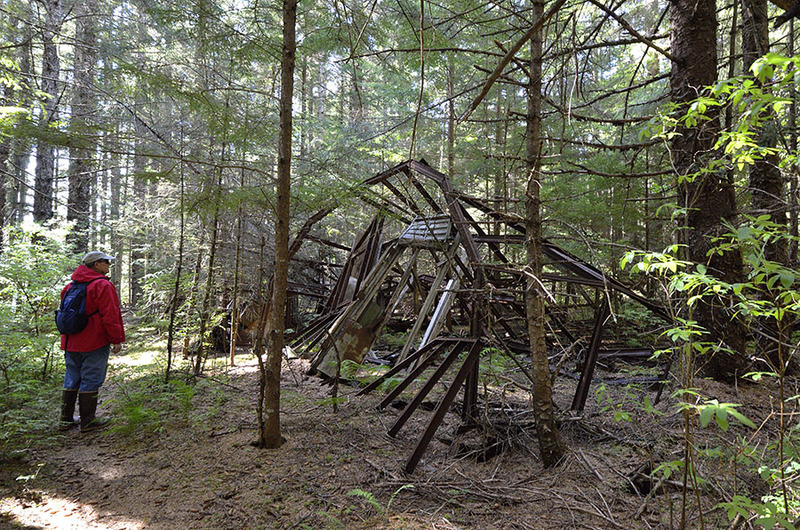 One of the old mine buildings has slid off its foundation and now sits on private land along the south shore. The rainforest continues to reclaim abandoned buildings. Logging and fishing activities occurred around Funter Bay, but the most notorious event in the bay’s history occurred in 1942. The cannery closed in 1931 and the buildings were abandoned. When the Japanese invaded the far west Aleutian Islands in 1942, the U.S. Government decided to evacuate many of the Aleuts to protect people from the Japanese (a number had already been captured or killed on the Aleutian island of Attu), and they wanted to deny the Japanese invaders any benefit from the buildings and resources of those islands. Native islanders were hastily herded aboard transport ships, each allowed to take only one small suitcase, and they watched in horror as U.S. soldiers destroyed their homes and churches as the ships headed out to sea. Ultimately the Japanese never invaded additional islands in the Aleutians. 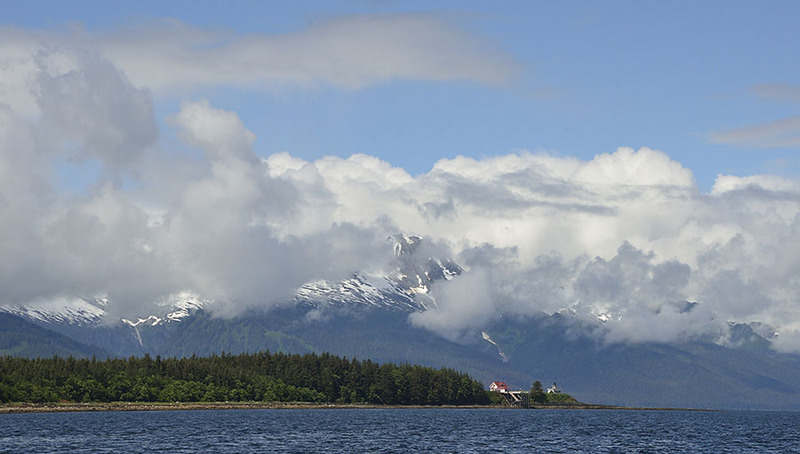 The islanders from the Pribilof Group – St. Paul and St. George islands – were brought to Funter Bay; residents from other Aleutian islands were brought to camps elsewhere around southeast Alaska. 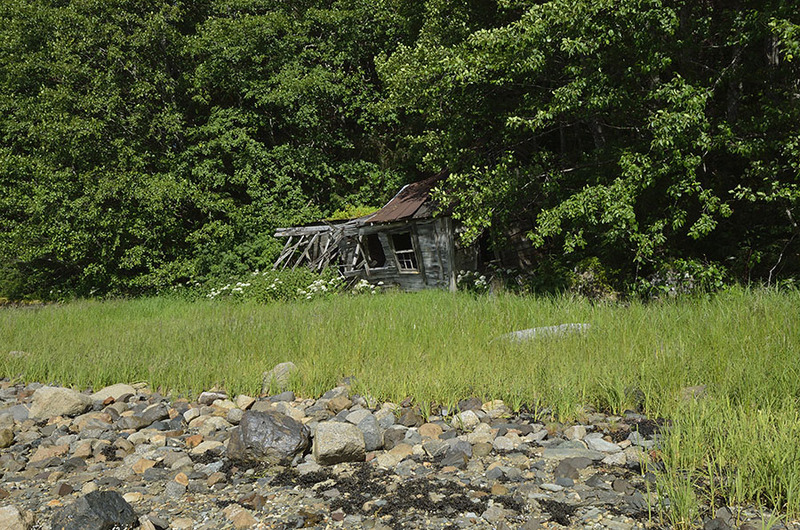 The Funter Bay group of about 500 men, women, and children were left ashore with little or no resources except the abandoned cannery and mining buildings that had been deteriorating for 10 years, as well as some hastily constructed quonset huts. These buildings weren’t insulated for the winter and there was no ready supply of fresh water available. Hunting and fishing were difficult with few boats and rifles. The islanders set to work to make the best of the horrific situation. 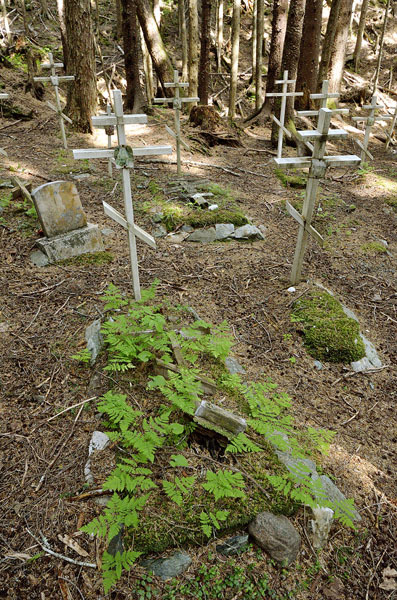 Between 1942 and 1944 about 10% of the displaced islanders died, and some 23 to 35 of them are buried in a cemetery in Funter Bay, still visited and tended by their Aleutian relatives. The location of the cemetery is a bit obscure, in the woods on Forest Service property behind a private home. 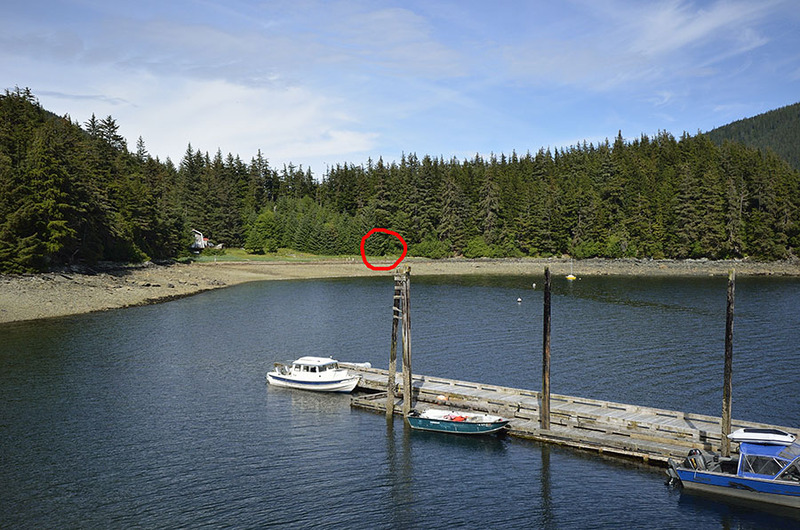 The trail isn’t marked, but can be found by looking for the small hole in the brush indicated by the red circle. You have to walk along the shoreline (easier at low tide) to get around to the right spot. Notice that the crosses are all in the Russian Orthodox style. 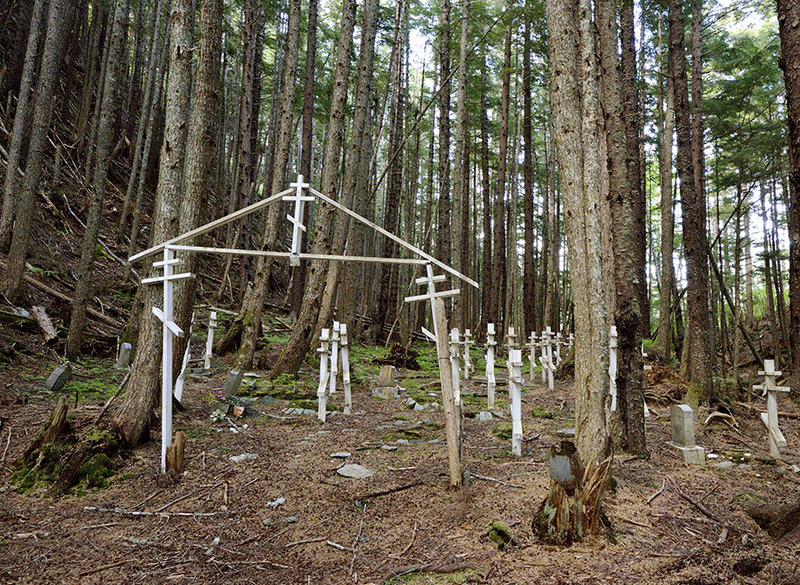 These people lived so far west that they considered themselves more Russian than American, and they followed the Russian Orthodox religion (as many other native groups even here in southeast Alaska do, particularly around Sitka). 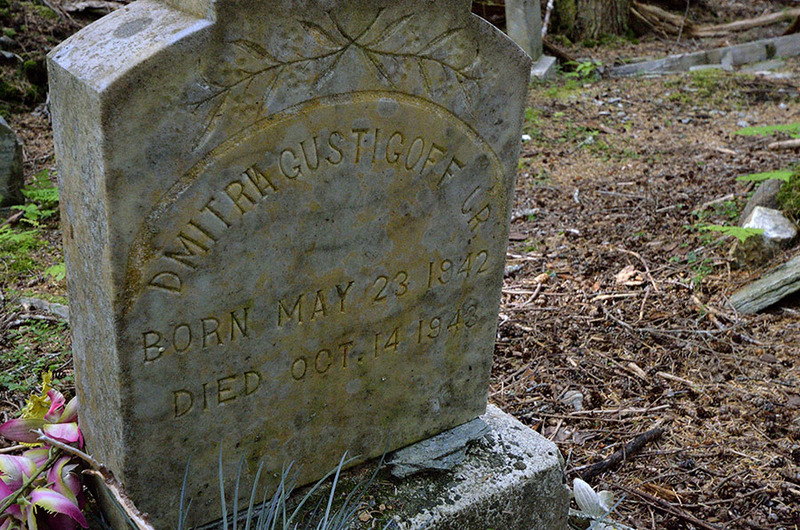 There were several children in the cemetery, though very few headstones or more modern grave markers were present. 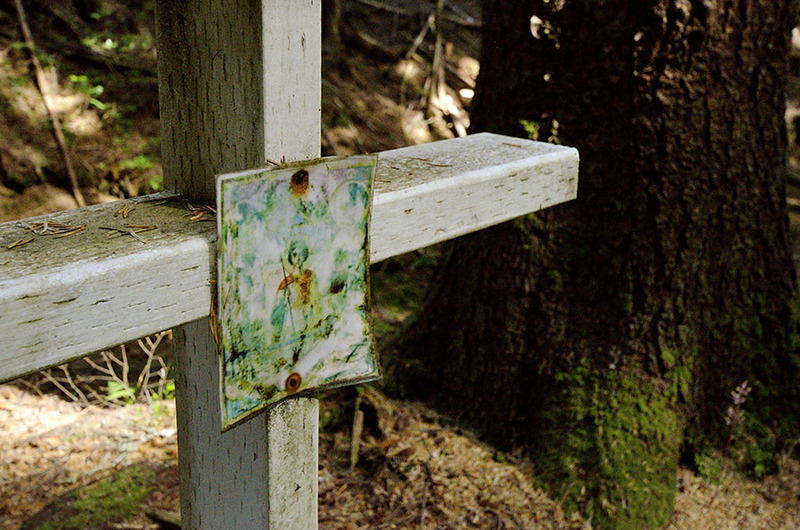 Pictures of saints were often attached to the crosses, replaced by family members periodically. 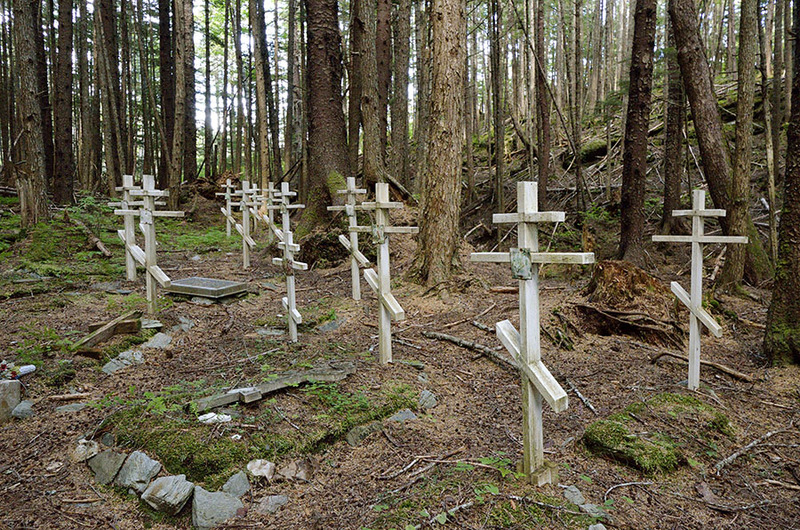 When one of the wooden crosses deteriorates and needs replacement, the old cross is laid on top of the grave and allowed to return to the earth on its own terms – you can see two of them in the photo below. Starting in 1945 the islanders were allowed to return to the Pribilof Islands, but there was nothing for them to return to. One of many sad outcomes from the war. 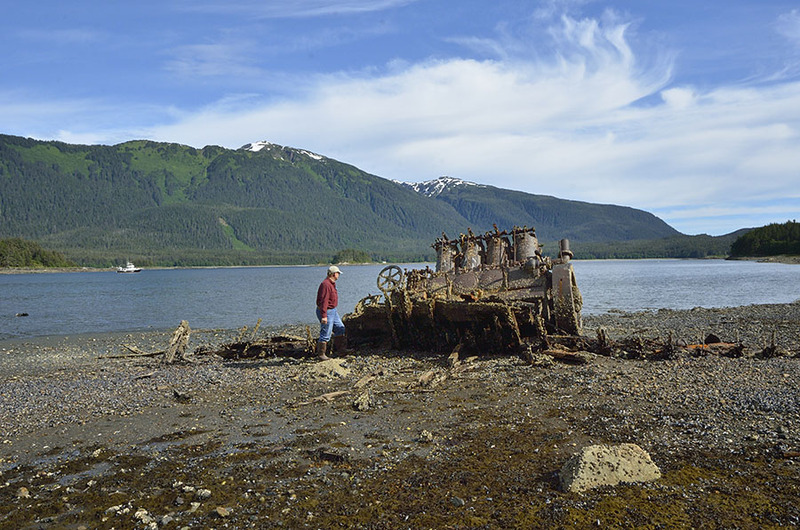 More evidence of the cannery and mining operations can be found on the beach, such as this wreck – thought to be a tug that sank around 1931, as well as barges behind the edge of the forest, slowly disappearing. 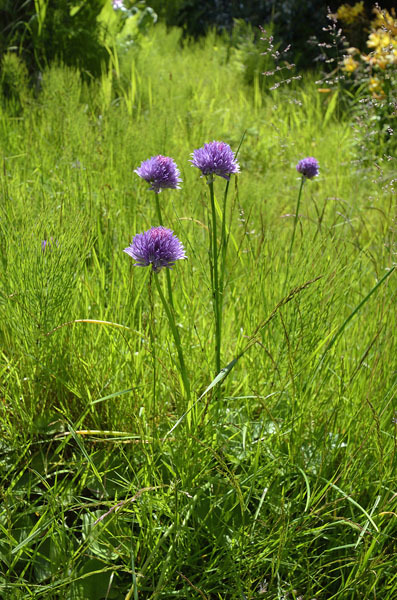 We love the grand landscape and all the wildlife, but culture and history are also in abundance here. Great history lesson & pics., thanks!